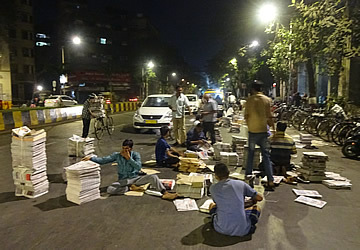 Newspaper vendors gather their papers from the distributor. 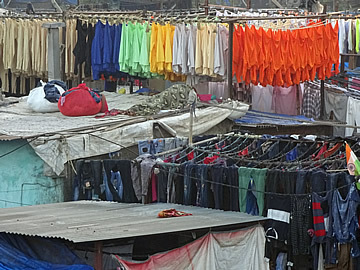 Part of the communal area of the Abode. 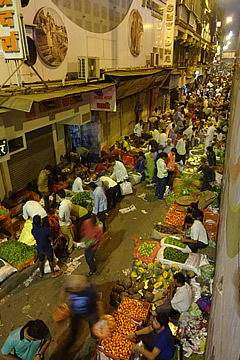 We rose at 5 a.m. and were taken by our guide through mercifully quiet streets to see the city at work. 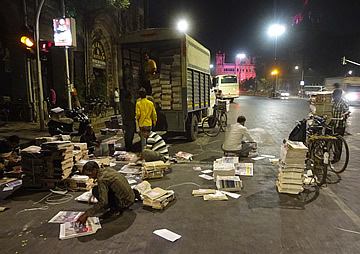 First to the newspaper vendors who gather to collect their newspapers from the distributors, bundling up their papers into stacks then onto their bicycles to take away and sell - a hive of industry and determination, just as we'd seen with the dabbawalas. 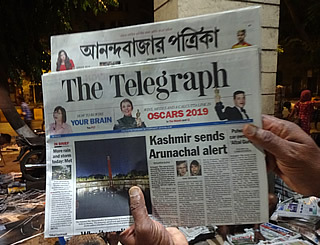 A Bengali and English Telegraph (Calcutta). 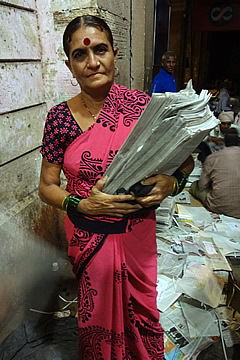 This is Bebi, the only female vendor; she looks a little grim but she was very happy to be photographed. 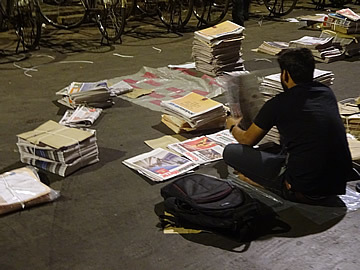 A supplier sits cross-legged on the pavement surrounded by stacks of papers to give to a number of "his" vendors to sell around the city. 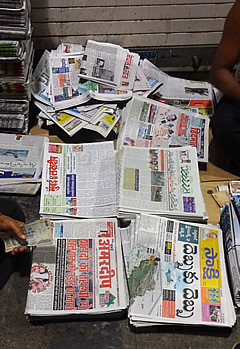 The newspapers are printed in many different languages including ENglish. 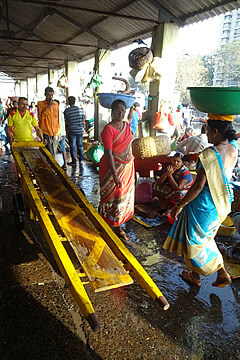 People were working at all kinds of tasks by the sides of the roads. 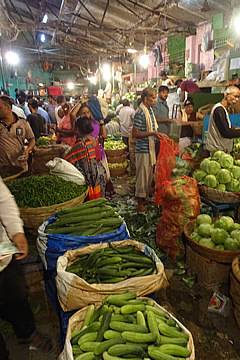 Men sorting greenery to sell for animal fodder, milk being brought fresh from the farms to store in big metal tanks for sale, especially for children in the morning. 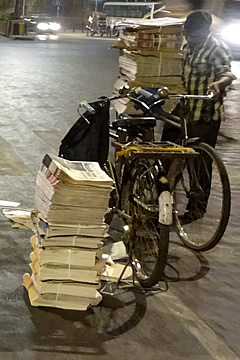 We passed one chap with a precarious load of bread, butter and eggs on his bicycle! 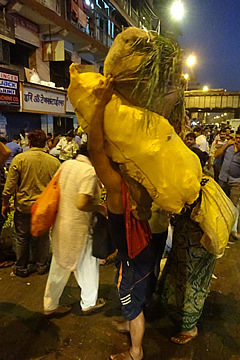 Sorting animal fodder for sale. The tank stores milk and keeps it cool. 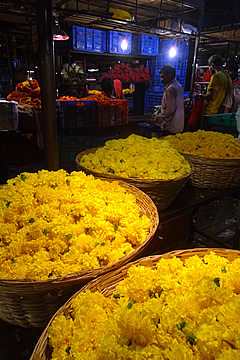 Our next destination was the most amazing flower market. 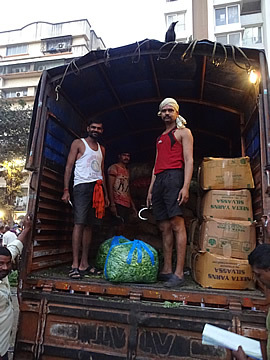 Numbered boxes were being unloaded from the backs of vans at breakneck pace, the unloaders yelling the numbers so that the right person gets the right box. 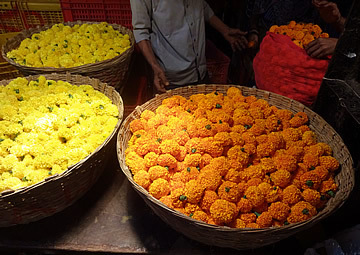 There were vast quantities of marigold heads, many destined for temples. 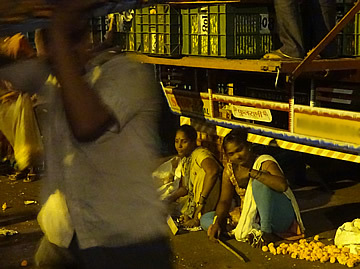 Girls sitting beneath the tailgate of the vans picked up any dropped flowers to sell. 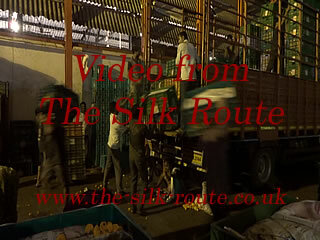 Video: Early morning wholesale flower market. 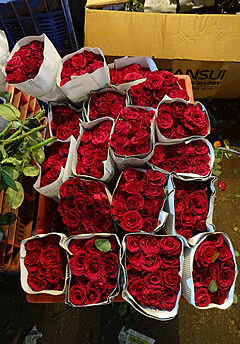 The flower hall is vast and extremely busy - you don't want to get in the way of these people, they have a job to do and they're going to do it fast! 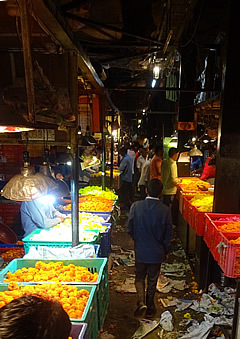 I was constantly apologising as I tried to follow our guide down the narrow aisles between stalls. Greenery as well as flowers are used in offerings to the gods - on the left to Shiva, on the right to Ganesha, though I don't know what either of them are! 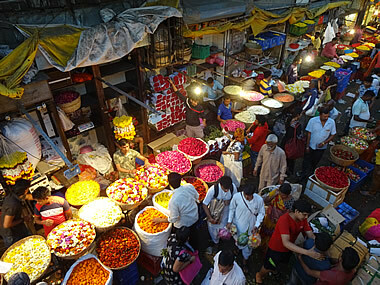 Outside the massive hall the activity continues with many different kinds of plants and flowers for sale. 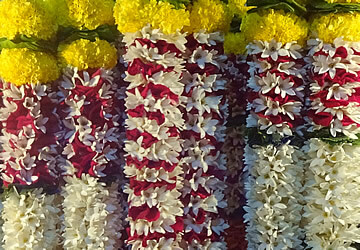 Long banana stems with leaves are used as decoration at weddings. 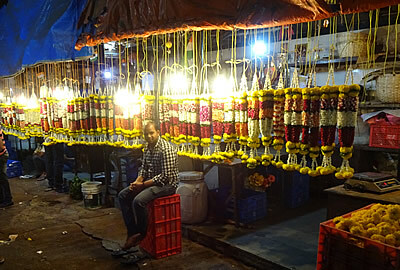 Wedding garlands selling here for about 1000 IRP will fetch twice that in the city. 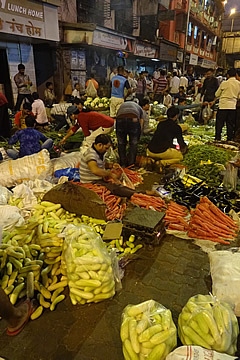 Outdoor fruit and vegetable market. 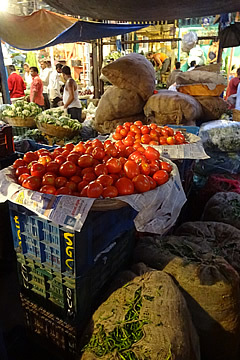 Our next stop was no less impressive - a massive fruit and vegetable market. 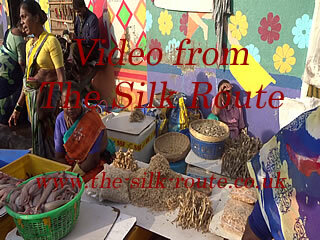 As well as hundreds of street vendors, there was a huge shed heaving with buyers and sellers. 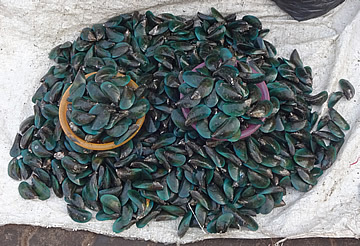 On the street the traders are unlicensed and selling stops at 1 p.m. 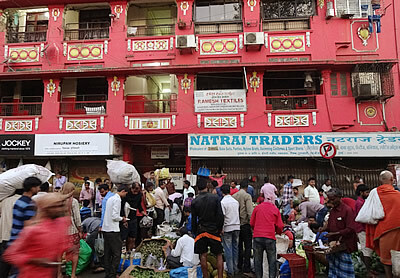 Inside the trading goes on all day. 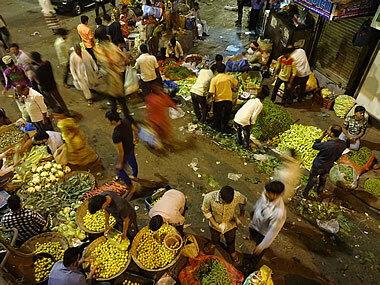 We parked on a part of the road that was raised so we were able to look down on the street traders before walking down and through hundreds of them to the covered area. 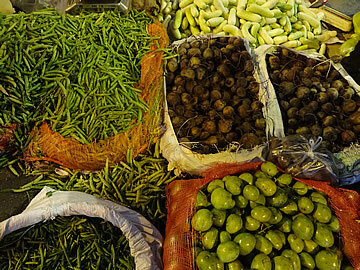 Green beans, some kind of marrow top right?, beetroot? 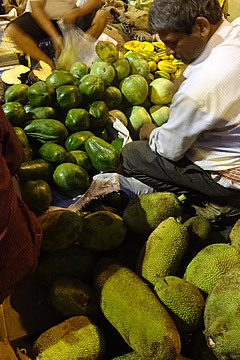 and I think ber fruit bottom right. 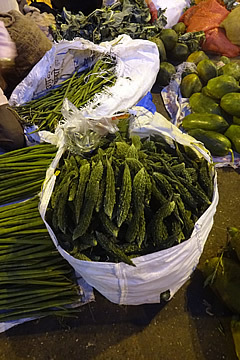 The crinkly green vegetable (bitter gourd?) 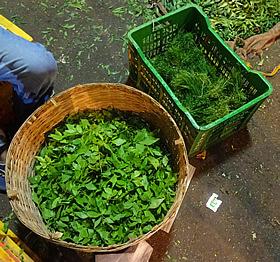 is said to be good for diabetes, but you mustn't drink too much (of the juice?). 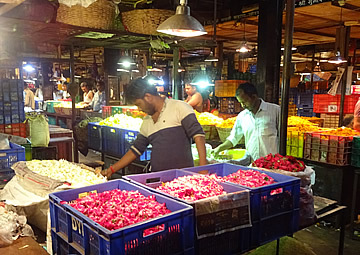 Vast quantities of fresh produce. 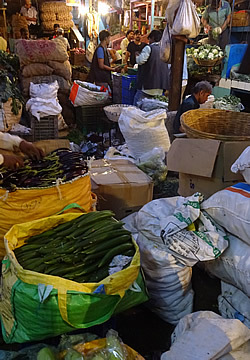 Bundles of lemon grass in the foreground. I asked before taking this photograph. Again we seemed to be the only foreigners here. 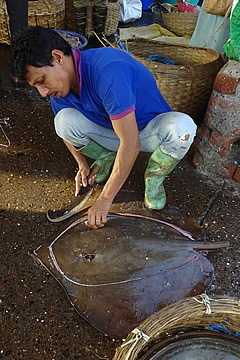 In general the people were OK with me taking photographs but we got lots of curious looks. I'm not sure they would take kindly to a lot of tourists getting in the way of their work. 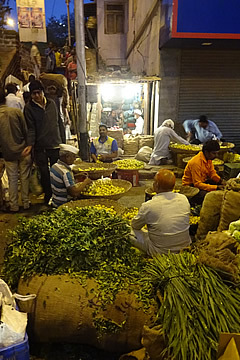 We did some crude price comparisons and worked out that a huge bunch of coriander being sold for 10 IRP would fetch over 50 CHF (about 3500 IRP) in a shop in Switzerland, packaged up in plastic with 20 g of coriander in each pack selling for 2.20 CHF. 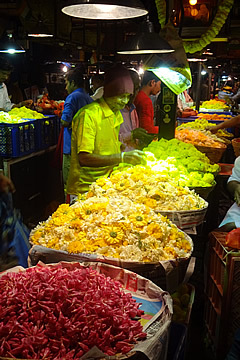 We viewed another flower market from a bridge - this was the top class flower market. 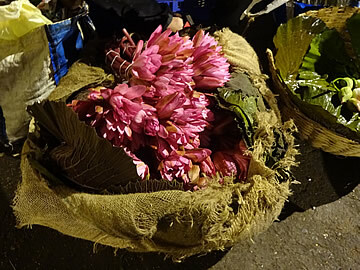 As well as baskets full of flower heads, they were selling stemmed flowers for five star hotels etc. Again, compared to European prices these were going for a song. 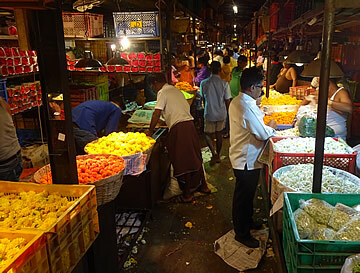 The top class flower market. 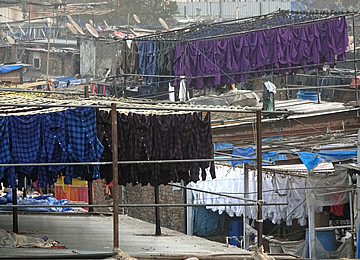 We had visited a smaller Dhobi Ghat in Mumbai previously but now we were able to see this vast open air laundry from a road bridge. 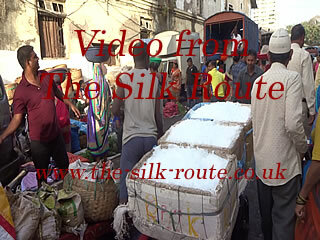 The traffic was beginning to build now so we didn't linger too long. 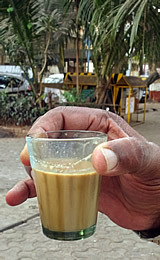 Time for tea - or rather masala chai, and it turned out to be the best we'd had anywhere in India! 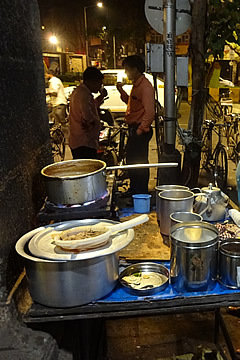 Although the chaiwala was squatting on the pavement to make his brew, everything was spotlessly clean. 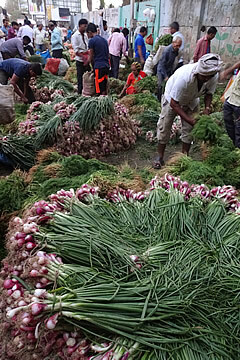 He had laid out hessian matting for himself and his cooker and the glasses and metalwork gleamed. 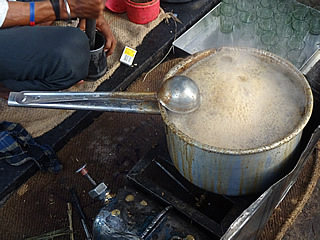 Along with traditional ingredients such as cardamom and ginger this chai was made with lemongrass and it was superb. 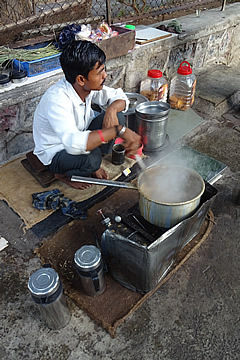 The pot boiled furiously before he deftly poured the chai into glasses. 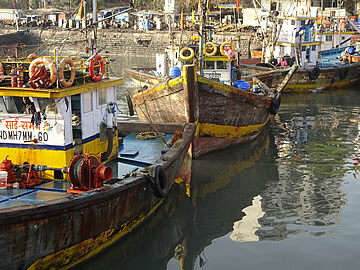 Our final stops were to see the fish dock and the fisherman's village. 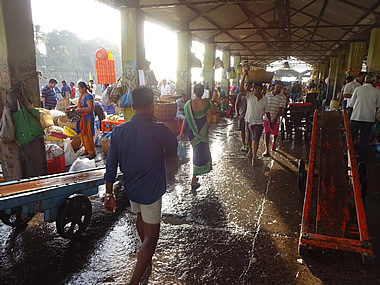 Sassoon fishing dock was also a hive of activity, everyone yelling at everyone else, to sell their fish or make people get out of the way as porters rush to and fro with long wooden hand carts. 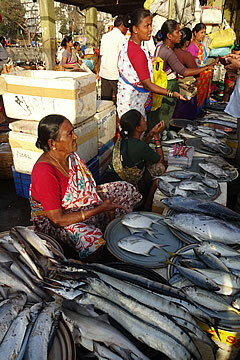 Masses of fish for sale fresh off the boats. 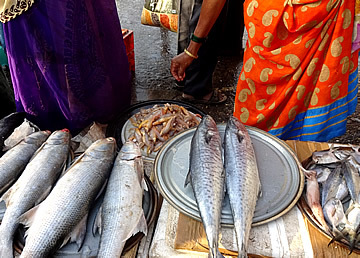 The men fish, the bigger boats going out for 10-12 days at a time, so they travel some distance, the women sell. 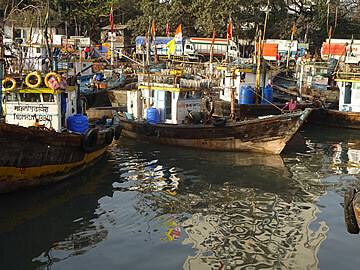 Big ocean-going fishing boats at Sassoon Dock. 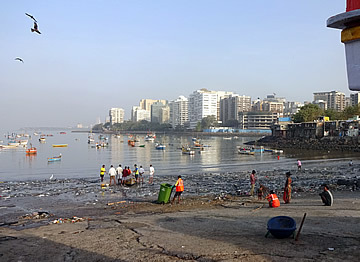 Sadly there is a lot of rubbish along much of the shoreline, most washed there by the sea. 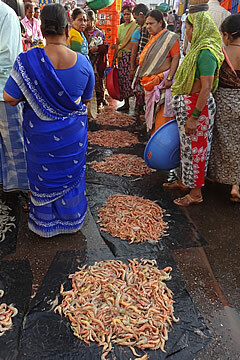 And finally a Koli fishing village. 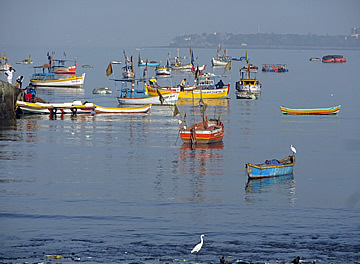 The Koli people are said to be the original inhabitants of Mumbai, the city founded on fish which then thrived on trade. 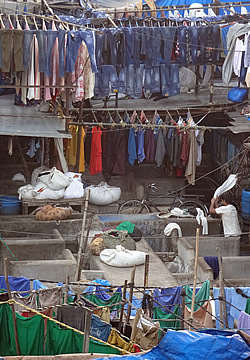 We didn't actually go into the village, just watched the activities on shore for a while. On the shore near the Koli fishing village. 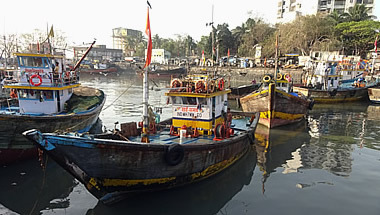 These smaller boats would go out for only a few hours. At the shore our guide told us that this was the spot where terrorists landed in 2008, either after hijacking a fishing boat and killing all on board, or on speed boats. 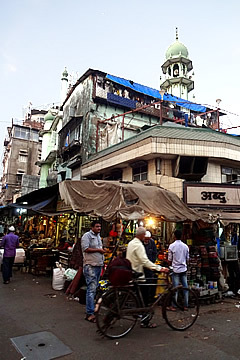 The terrorists then split up and attacked several targets associated with Americans and British including the Taj Hotel and the Leopold cafe. Close to 200 people were killed. Early one evening we went with a guide, on foot and by tuk tuk, to taste different foods around the city. 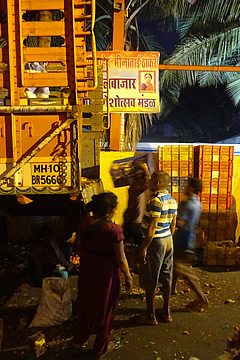 The traffic in Mumbai is appalling, the worst we've ever seen, including Hanoi and Saigon! Everyone uses the horn all the time so it is deafening too. They are in the process of building a metro in the city which is snarling up the traffic even more, so getting around by car is really slow. 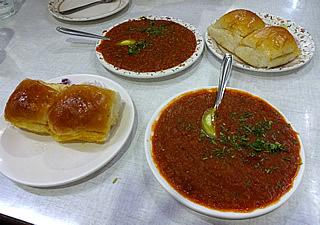 We began in a nearby cafe with Pav Bhaji - bhaji means vegetables. 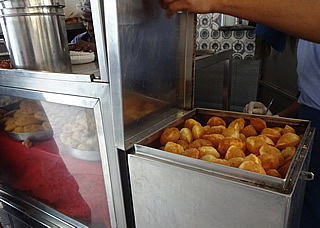 The Pav comes from the Portuguese for bread - pau. 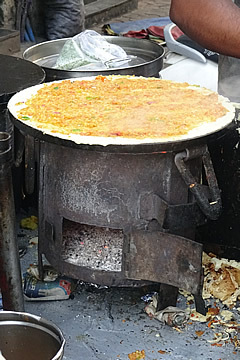 This was a bread bun with melted butter on the top to eat with a spicy mixed vegetable puree. 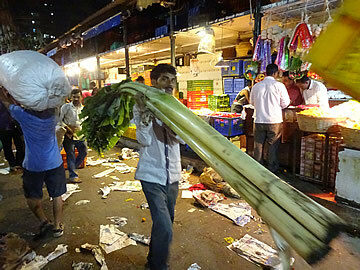 It's a Mumbai specialty and very good, typically eaten in the evening at the start of a meal. 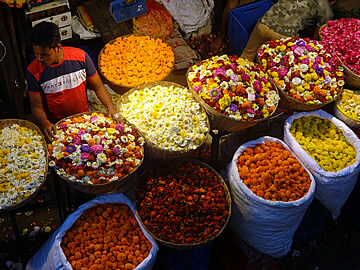 Then on to a puri stall, specifically "Sharma's Bhelpuuri and Fastfood". 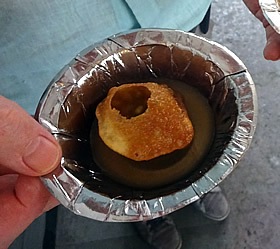 Puri is a deep-fried unleavened bread which forms a small hollow ball. 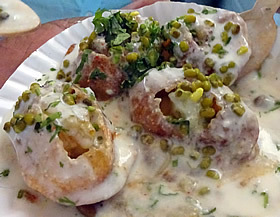 We had Dahi Batata Puri - the crisp shells stuffed with potato and yoghurt, Pani Puri - where the shells have a hole broken in the top and are filled with a flavoured hot water, sweet chutney and chickpeas, and Bhel Puri, my absolute favourite, sweetened and with a crunchiness from puffed rice, vegetables, and in a tamarind sauce. All delicious. 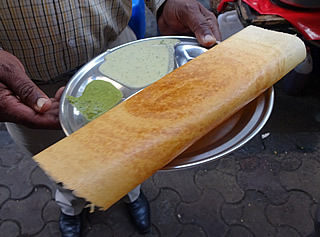 Next to a crepe-maker - very large thin pancakes stuffed with spicy mashed vegetables called Mumbai Masala Dosa, with two dips, one yoghurt based I think, followed by a cheesy version. 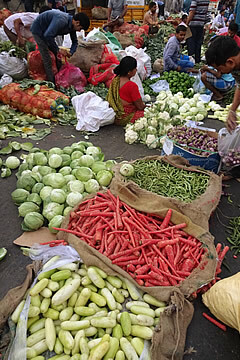 We were already beginning to feel rather full! 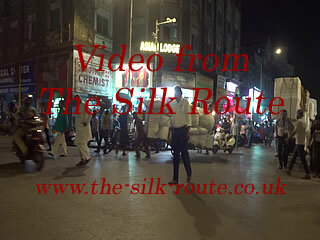 We had to take a tuk tuk to our next stop. The traffic was worse than ever and it took and age to get where our guide wanted to go. 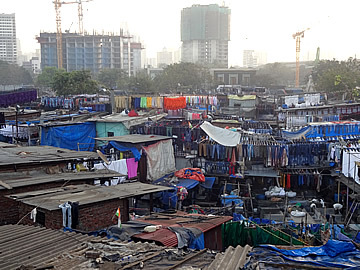 Video: Very noisy Mumbai traffic. 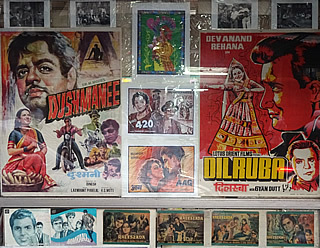 Bollywood posters - Mumbai is the centre of the Bollywood industry. We passed by the metal workers area which was still very busy - they seem to work well into the evening, much cooler then of course. 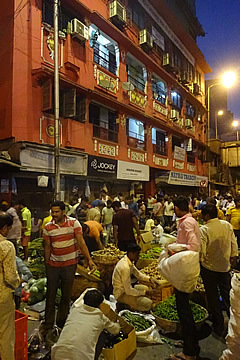 The streets were alive with markets. 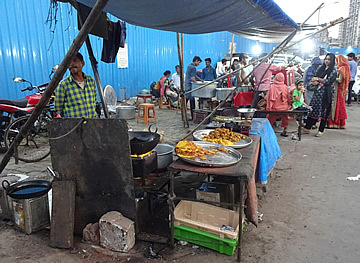 Kebabs were next at Haji Tikka in a Muslim district. 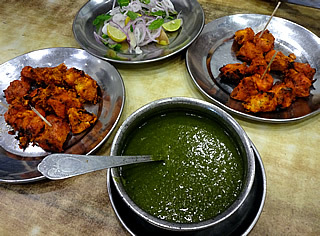 Very tender chicken, rather an odd texture, almost too soft, served with spicy chutney. 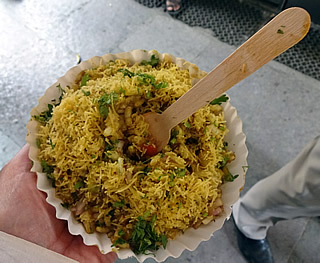 We were absolutely stuffed at this point but had just enough room for excellent pineapple and guava ice creams at the 130 year old Taj Ice Cream shop next door. 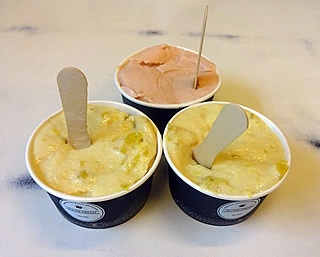 One guava and two pineapple ice creams. 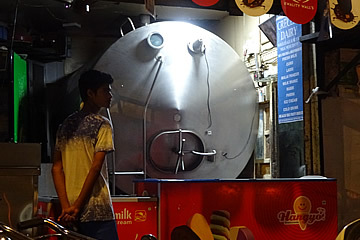 These are hand made "sancha" ice creams made only with natural products - fresh cow's milk which is cooked then cooled, mixed with fruit and other fresh ingredients then frozen by churning for two to three hours in a vessel surrounded by rock ice. 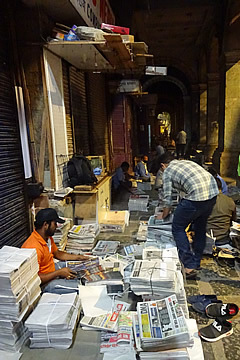 Lonely Planet Goa & Mumbai (2015) PDF Chapter was used on this trip.